A Chinese government-owned company is building high-speed freight trains to run on tracks now carrying passenger-only bullet trains, Caixin Online reported. This will usher in a new era of cargo transports by rail. It quoted an executive at China Railway Rolling Stock Corp. Ltd. (CRRC) as saying that the first super-fast freight train will roll off an assembly line in the first half of 2016, said. The executive, who declined to be named, said the new freight trains are being modeled on existing bullet trains and assembled at CRRC's Tangshan Railway Vehicle Co. Ltd. 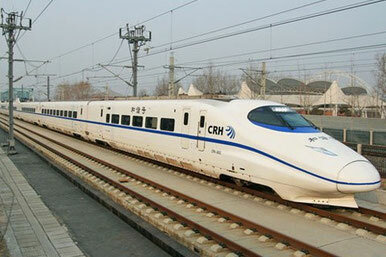 The new train has been designed to haul cargo at speeds of up to 250 kph, a CRC employee said. The country's bullet trains can run at up to 350 kph. The freight trains will be able to travel on some of the more than 16,000 kilometers of high-speed rail lines that crisscross China, transporting cargo such as e-commerce packages. They will not carry bulk commodities such as coal, the person said. Most freight trains follow rail lines designed only for low-speed travel. The nation's fastest freight trains, which were put into service starting late last year, can run up to 160 kph. Demand for non-bulk cargo has been rising, spurring development of a high-speed freight train, the CRC employee said. CRC trains hauled about 2.5 billion tons of goods in the first nine months of the year, down 11.4% from the same period in 2014, company data show. Non-bulk cargo tonnage rose 12.2%. To meet this demand, last year the CRC deployed six express cargo trains running on four routes to carry non-bulk cargo. These trains can reach speeds of up to 120 kph.